Has anyone noticed this small little easter egg on the windshield of their E Pace? Think its a reference to the fact that this is the baby cub to the full size F Pace. As cool as these are, its not for our benefit but for Jaguar so we don't buy aftermarket OEM replacements, they want us for life. I don't even know how you would come across this without looking for it. I know the same image is also found in the puddle lamps. Used in the manner I mentioned, people would be looking for them, specifically the dealer to help confirm its an official Jaguar product. Oh and of course enthusiasts like us that appreciate the unique touches. That's a good find John! Didn't even know that was hidden there. Is it noticeable at nighttime? 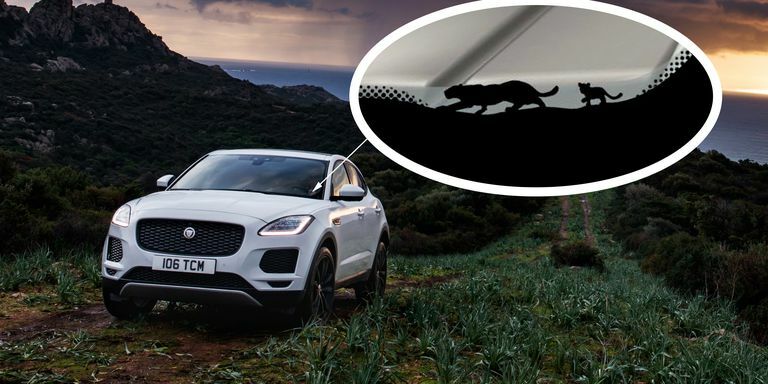 I never realized how much Jaguar was into easter eggs but one of the best ways to help find them is looking back at other models, the F-Type being one of them. Good question :-) never looked at it at night... will have a look.. I bet if we were to bother the right person at Jaguar they would probably give us a list of where all the easter eggs are located. On my friends new Jeep we found them in some of the most interesting places, some thanks to publications for pointing them out. The problem with being the 'baby' is they get less of everything and are a bit rough on the edges. They're also on the chubby side despite being smaller. (E-Pace weighs the same as F-Pace).